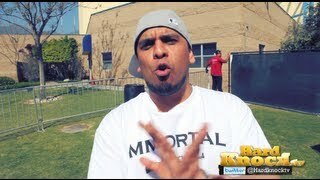 http://www.hardknock.tv Backstage at Paid Dues we caught up with Immortal Technique. In this interview Immortal talks to Nick Huff Barili about early Hip Hop memories, being locked up in prison, Monsanto lobbying Obama, interactions with fans on twitter and the work he is doing with The Green Light Project. Oh yeah and his new album Middle Passage is coming! "That's a disgrace. It should be a human rights abuse," said Technique when asked about the Act. "It should be banned. They really want to control the food industry in general. And I think what's disgusting about them is that -- Listen, we know Monsanto and their parent companies have given the Obama administration money." Immortal Tech on the Monsanto Protection Act. Immortal Technique speaks truth on Alex Jones show Guns ,Government , History , Hip Hop , Drugs Visit immortal technique twitter page below https://t... CHART. For those who like Immortal Technique.. A Midwest college has expanded their diploma program to include a degree in Hip Hop Studies, which is a first of its kind.